The third annual Ratha Con wrapped up this weekend in Athens, Ohio. The main event was on Saturday, April 26, 2014, in the gymnasium at the Athens Community Center. Larry Blake and Terence Hanley had their books, magazines, posters, and prints on display. Like last year, The Athens News featured Ratha Con as its cover story. The story this year is marred by the absence of Larry's smiling face. (In 2013, he made the front page.) The article is called "Pop Culture Extravaganza! Ratha Con Delights Diverse Fan Base in Athens," the author is Christian Law, and it's in today's paper (April 28, 2014). 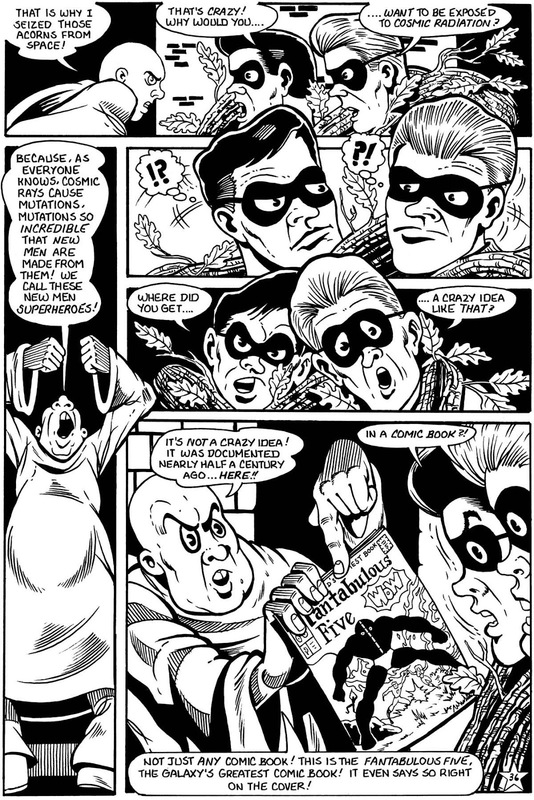 In a two-part story in Five Star Comics #2 and #3, The Amalga-Mates, the world's first Siamese twin superheroes, go up against Doctor Hugo Wickwaff, who is convinced that acorns taken on board the last space shuttle mission have special properties because they have been exposed to cosmic radiation. Doctor Wickwaff steals the acorns. The Amalga-Mates take on the task of retrieving them and delivering him to justice. So why does Wickwaff think irradiated acorns have special powers? Because that's how his favorite comic book supergroup, The Fantabulous Five, got theirs. But that's just a comic book, you say. (Actually it's a comic book within a comic book.) Well, before you begin scoffing, read "'Cherry Tree from Space' Mystery Baffles Japan" on the website News.com.au (Apr. 12, 2014) by clicking here. There you will find that cherry tree seeds taken into space in 2008 and planted upon their return have resulted in young trees that have bloomed six years ahead of schedule. "Exposure to cosmic rays?" you ask. "Exposure to cosmic rays?" the author of the article asks. "Of course, there is the possibility that exposure to stronger cosmic rays accelerated the process of sprouting and overall growth," says Kaori Tomita-Yokotani, a researcher at the University of Tsukuba. "From a scientific point of view, we can only say we don't know why." We can only advise Kaori to read more comic books. We can only advise you that the trees bloomed on April 1. Five Star Comics is a joint venture of cartoonists and comic book creators, some experienced, some just beginning, all committed to making fun and wholesome comics in the spirit of the Golden Age and Silver Age of Comics. Five Star Comics . . .
and its main title logo and design are trademarks held in common by the six original creators of Five Star Comics. All original characters, concepts, situations, stories, and artwork are copyrighted by and/or trademarked to their individual creators. All rights are reserved to them. The Five Star Comics main title design used as the heading for this page was designed by Seth Boring with Gary Gibeaut and is the property of Five Star Comics. All content copyright 2011 by the individual creators and by Five Star Comics. All rights reserved. Simple theme. Powered by Blogger.